Is it time to harvest potatoes? It depends… Here are a few tips for properly timing your potato harvest. As we enter late summer, the time for potato harvesting approaches – at least if you are in the Northern part of the U.S.. However, you may be wondering, just when should you harvest potatoes? The answer to this will partially depend on what kind of potatoes you are growing, and what you are harvesting them for. If you are harvesting them as “new” potatoes for immediate fresh eating, you can harvest earlier than you would for storage potatoes. Potatoes that will be saved for winter storage should be left in the ground longer, so that their skins can toughen up. New potatoes will go bad very quickly, but many storage potato varieties will keep for several months when properly stored. 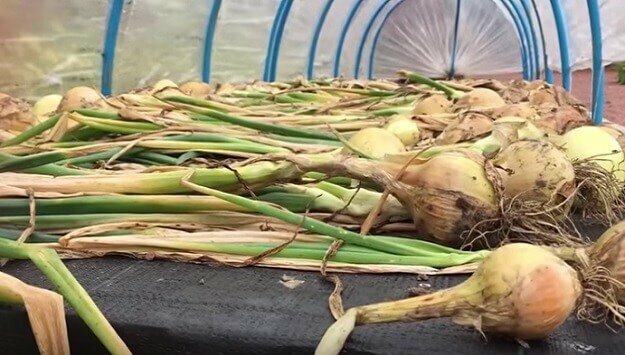 Any type of potatoes can be harvested for new potatoes. Most types of potatoes can also be kept for storage as well, although some varieties will keep better than others. 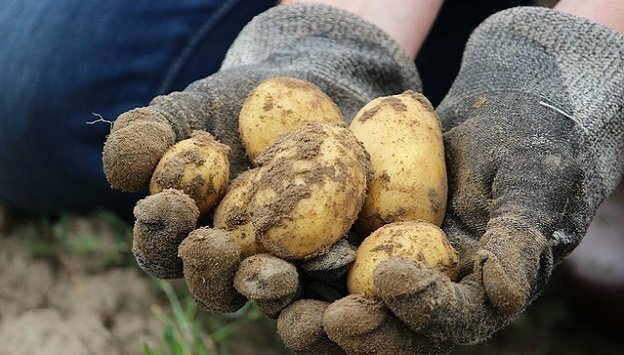 New potatoes can be harvested in spring and early summer, but this tends to sacrifice the parent plant so that it will not produce mature storage potatoes later in the season. If the plant is lifted with great care, some of the immature tubers can be removed as new potatoes, and the plant can be re-potted in new soil. This causes some stress to the plant, and is not generally recommended. Usually a row (or container) is sacrificed for new potatoes, and the left rest to mature to full size. New potatoes should be harvested and handled carefully in order to reduce bruising and damage to the skins, both of which can cause decay. Storage potatoes are harvested once the plant is completely mature at the end of its growing season. At this time, the foliage begins to yellow and dry, normally from the lower leaves progressing upward. Some late potato varieties may still be green and bushy by the time early and mid-season plants have completely withered. For the best storage potential, mature tubers should not be harvested for at least two weeks after the foliage above ground has died. This waiting period allows the skins of the tubers to thicken, which is key to long term storage. Thick, unbroken skins (just as in winter squash and onions) reduce the loss of moisture from within. If frost is expected within two weeks while plants are still green and vigorous, many growers defoliate the tops in order to trigger the skin setting process. A weed trimmer can be used to shred the leaves and stems of the plants so that death is gradual rather than sudden. If the plants die suddenly (including death to hard frost), the tubers may be discoloured. It is simpler to just select the appropriate variety for a given growing region in order to avoid artificial defoliation.